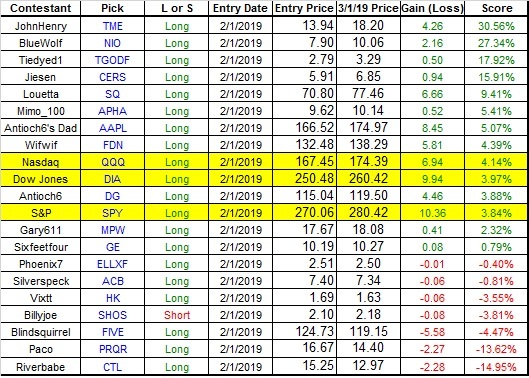 This month's results show why in recent years I've been picking these wild-assed stocks for the contest. This year I picked a solid stock, it gained 10%, and still 25% of the people in the contest are ahead of me. I saw this years ago and so I started picking these hero plays which would either get crushed or go up 400% and none of them worked. Thanks, and enjoy the hiking, JH! Last edited by BlueWolf; 03-07-2019 at 05:04 PM.